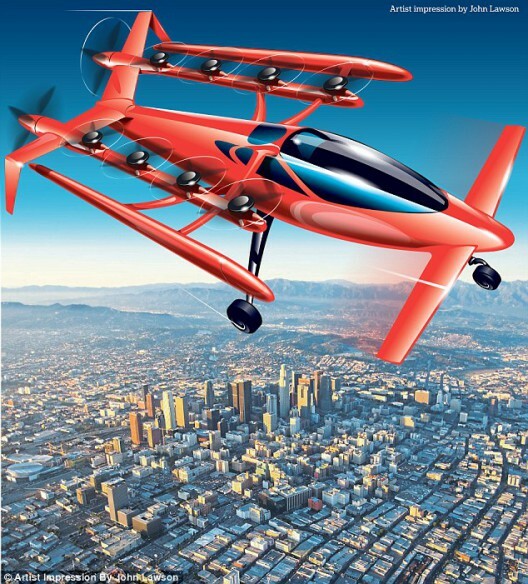 Blog Larry Page’s Flying Car(s)? A3 backed by Airbus, EHang 184 from China, and Zee from Larry Page (head of Google) – Silicon Valley seems an unlikely source of aeronautical breakthroughs, but several entrepreneurial outings from Airbus, Chinese startups, and Zee.Aero, led by a secretive Larry Page, have interest growing. A pair of recent flights by Zee’s craft in Hollister, California have generated coverage – and speculation. It turns out Page has a second company, Kitty Hawk, taking yet another path toward electrified flying cars with something like a large quadcopter – not unlike the eHang 184. Neither Zee.Aero nor Kitty Hawk is affiliated with Google, both funded out of Page’s largesse. One theory is that his two companies, the first started by noted aerodynamicist Ilan Kroo and the second headed by Sebastian Thrun, will engage in a friendly competition to create the best device for future development. Considering the secrecy, or perhaps because of it, a few recent flights by what ostensibly is Zee.Aero’s craft has stirred up interest from London’s Daily Mail to Bloomberg’s financial pages. The Mayor of Hollister and airport neighbors seen intent on helping maintain that secrecy, leading your editor to believe that that spy photos might be few and far between, or to counter that, Jane’s All the World’s Aircraft will have people on the scene even as we speculate among ourselves. Sharing these videos and pictures with friends has resulted in varying degrees of problems in identifying the craft as the vehicle shown in Zee’s patent drawings. Mary Grady of AVweb reports “The aircraft, seen in photos published online by the Monterey Herald, appears to be based on a Tecnam fuselage, with an array of small propellers mounted on booms in front of and behind the wing, and a pusher prop mounted beneath the tail. A knowledgeable source who spoke to AVweb today on condition of anonymity confirmed that the aircraft in the photos is Zee Aero’s latest model. The compression that comes from long telephoto lens shots of the machine makes positive analysis of features on the craft difficult. Certainly, the fuller depth of the fuselage looks like the Tecnam fuselage (also used on NASA’s X-57 test vehicle). Eyewitness accounts, though, emphasize the quietness of the machine during its two brief hovers. That is one of the requirements for finding acceptance in neighborhood airparks. With Oliver Garrow having also made test flights with his Elytron test bed at Hollister, the site may become the Skunkworks for future urban aerial transport. We hope to see the fruition of many talented efforts coming our way soon. Zee personnel have already set one record for personal flight, although not one the average commuter will embrace enthusiastically. The team’s 2013 Red Bull Flugtag entry did set a record for distance, but probably did not get the team invited to Dancing with the Stars.